Pruning roses in the fall should be done lightly and only as necessary to help them see their way through the winter disease-free and without damage. In warm and temperate climates, fall pruning is minimal. In cold and freezing climes, fall pruning is more severe. The bulk of rose pruning for size, structure and shape should be conducted in the spring after the last hard frost, write Cindy Welyczkowsky and Jane Martin at Ohio State University. Cut back dead, damaged or disease canes and foliage back to the point of healthy cane tissue that is white in color on the interior and green on the exterior. 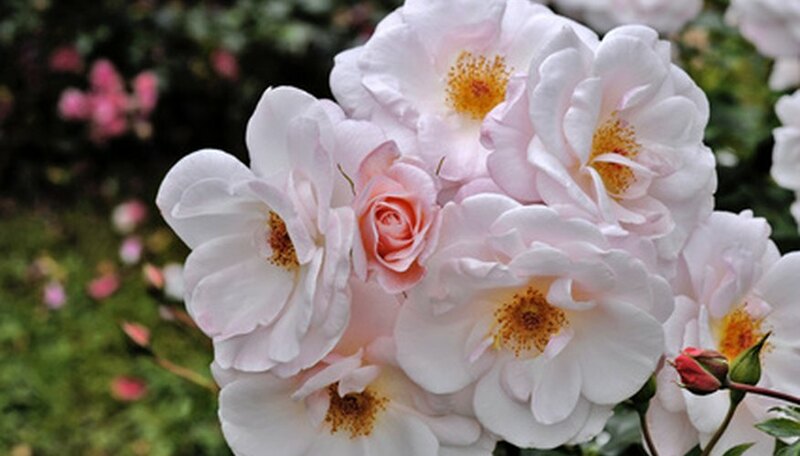 Winterize rose plants grown in cold or windy winter climes by cutting canes down to roughly 30 inches before securing them with ties to prevent breakage. Cut the canes lower as needed to fit under fixed rose cones or other winter protection products. Pull all pruned canes clear from the canopy and lift up all cuttings, dropped leaves or petals from the soil surface to prevent the soil surface from being a breeding ground for pests and disease. Always prune roses with sharp and sterile cutting blades to prevent the transfer or invitation of disease. Wipe down cutting blades with isopropyl alcohol and scrub off any built-up plant tissue with a clean scrubbing pad or brush. Why Does a Rose Petal Edge Turn Brown?